Invitation Letter to schools, colleges, universities, companies and organization to participate in a health fair for medical students. You can use this letter for various other events organized for the students. The students of Shaikh Khalifa Bin Zayed Al Nahiyan Medical and Dental College Lahore (SKZMDC Lahore) are excited to be organizing a Community Health Fair, the first of it’s kind in Pakistan! This health fair is open to the public, and we are inviting members of the local community, schools, colleges and universities of Lahore, and also prominent medical colleges of Pakistan to attend. In this fair, among other sections, we have an awareness section. We would be delighted if (name to invite) would send representatives to help with disability awareness at this fair, since special people face huge problems in Pakistan, and are often not recognized for the truly unique and wonderful individuals that they are. We would of course try to provide you with anything you require; space, tables, chairs, projectors, etc. Please take a look at the website(semioffice.com) for this event for further details. The venue will the grounds of (Venue) Lahore, and the date is 28th April, 2017. We the Dental Department of XYZ Medical University are writing this letter to ask you of your presence on the account of the Annual Health Fair. This is the first time we are hosting a health fair and couldn’t think of a better time than to be an honored by the presence of the biggest dental surgeon in the country. As you know, that our university teaches the medical academic books written and published by you, what more would excite them then to see the author of those books right in front of them? The health fair will consists of several Blood Donation Camps, some pharmaceutical companies that are coming over to deliver lectures on their medicines and much more. As our university just started its academic operations we would like you to deliver a speech for our students motivating them and telling them how important the medical field really is. We hope that you will honor our event with your presence and help us in welcoming you with the warm welcome that you deserve. 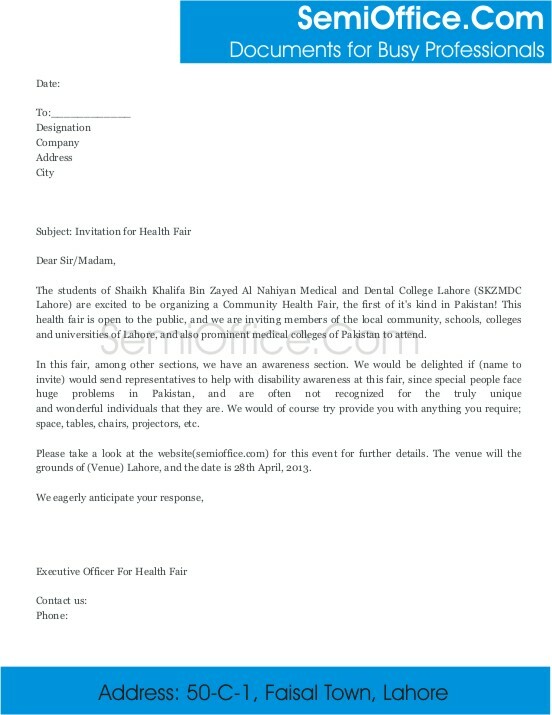 Whole heartedly, I am writing this letter to invite you on the health fair in our medical university. In this fair some talented doctors are invited and they will give some health tips to the student and will motivate our young generation to excel in this medical field. As you were the best science teacher I had in college life so I will be glad to see you in the exhibition. I know you will enjoy this fair and I would love to see you there. Your presence will make me glad. The event will be on the coming Saturday at 12:30 onward in the front courtyard of my university. I will be there with awaiting eyes.